Join us Thursday, June 28th to listen to Nicole Lepping, founder of The Sequim Wheelers is the first Wheelchair Bike Program on the West Coast. She will speak to us about the new non-profit organization that will provide free Wheelchair Bike rides to the elderly and disabled on the Olympic Discovery Trail in Sequim, Washington. It's a way to help others to enjoy quality time in the outdoors on a wheelchair bike. It is for folks that can not ride any other bike by themselves. 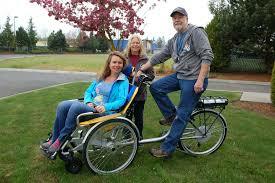 There are five existing Wheelchair Bike Programs in the US, four are on the East Coast.